We will watch Tim and Richard working on layout while Steve is cutting the tenons for rafters. 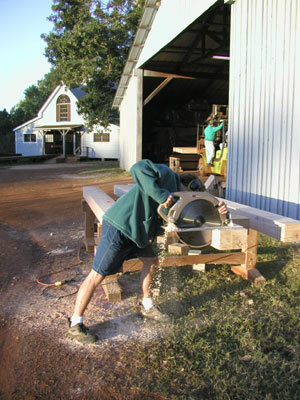 Travis is still cutting timbers to length while Keith and Chet are working on some of the larger timbers in the Layout Barn. 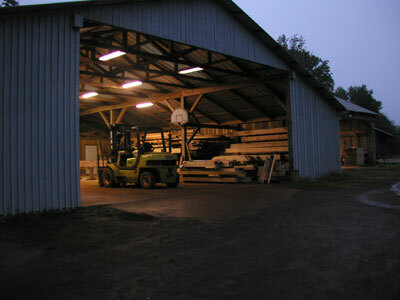 The rain has finally stopped but it is rather cold and dark when we came to work in the mornings, but it doesn't take long for the shop to get into full swing. 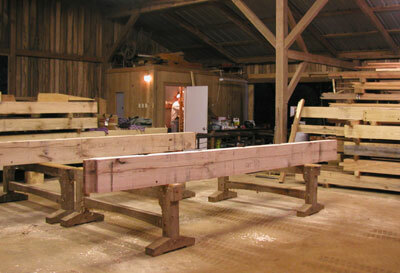 Notice the number of red oak timbers stacking up in the Layout Barn! We have been moving at a good pace and there are a lot of timbers ready for final finishing. Keith can be seen in the back storeroom getting ready for another day of layout work. You can see one of the bigger red oak timbers in the foreground. This particular timber weighs over 1,000 lbs. and can be a handful. 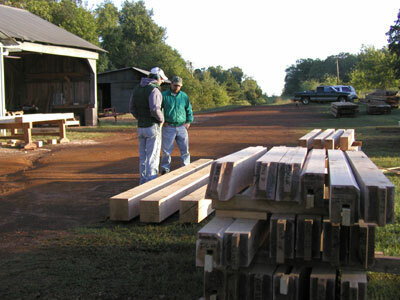 You can see the stack of larger timbers that Keith will be working on today in the background. It takes two men and a forklift to maneuver these timbers into place so the work naturally slows down a bit at this point. But the crew feels like they are slightly ahead of where they wanted to be by this point. 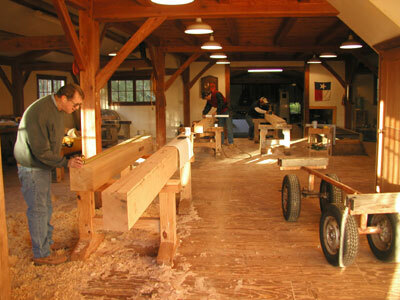 As the morning sun streams through the timber shop windows, activity in the shop moves into high gear. Steve in the background is working on a set of rafters while Tim is laying out more frame girts. Richard is checking Tim's work to make sure he's running accurate numbers. Everyone's work is checked... even Tim! 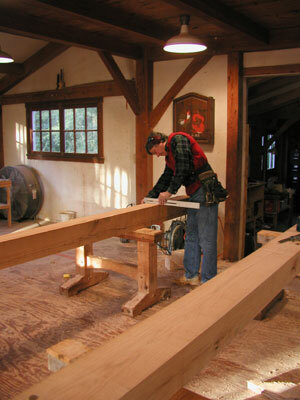 Steve is making the tenon at the end of this rafter timber. These particular timbers have angles and lines that run in directions that don't seem square because the rafter itself is designed to lay at an angle on the plate timber along the side walls. This is how the roof pitch is formed. Because complex angles create multiple opportunities for mistakes, the work is checked very closely. 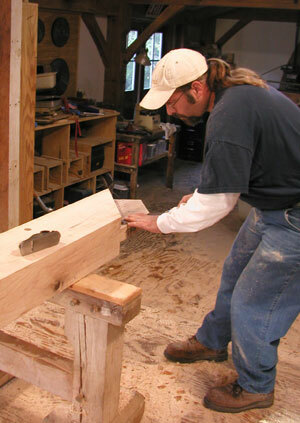 Steve is using his hand chisel and hand plane for the right angle corners of the tenon. As with all the joinery, this requires attention to detail and the ability to think in three dimensions. Tim continues to stay ahead of the shop crew during layout. 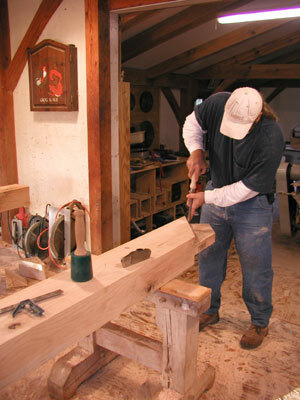 Here is using a carpenter's square to check the angles on this timber. Travis continues to cut girt and rafter timbers to length. Frankly, none of us can see how this guy can wear shorts when it's this cold! Youth is indeed wasted on the young! Finished timbers continue to pile up. Here Keith and Chet are checking several timbers to be used as post. They are making sure the timbers they select have the proper appearance grade for the intended application. In the next report, we will look at some different joinery that has been cut and discuss our marking strategy.